For those of you wondering, no, there is no rhyme or reason to how many bees that Beeckoning Scootsie exploded into, though I might go back and count them in the morning to see if my subconscious was trying to send me any messages. I made an alternate ending that I liked about as much as this one – you can see it here and let me know if I made the wrong decision. In other news, friend of the comic L.A.W.L.S. 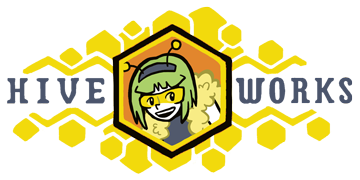 did its first Tuesday update today, which features a cameo from a certain lady beekeeper who you may be familiar with (hint: it’s Trigona). BTW, i recognize the ” ‘d! ” at the third panel, is that a homestar runner.com reference? i watched the rule 63’d adventure time episode, and it was kinda funny. i just wish that the ending wasn’t the steaming pile of crap it was. What? I loved the ending to that episode – the more you think about it, the creepier it gets. No, you made the right choice. I think they’re both equally as hilarious. well… since beestings seem to create more .. entities, each one more disturbing than the last.. I vote for the alternate ending!